The story is set in ‘a dystopia’ that became a target of biological warfare 30 years ago. The protagonist enters this ruined city, and he ends up heading to the top of a building to get away from autonomous robots that are controlling the city. There, he sees a forgotten planetarium and a companion robot called Yumemi Hoshino standing at the entrance to it. 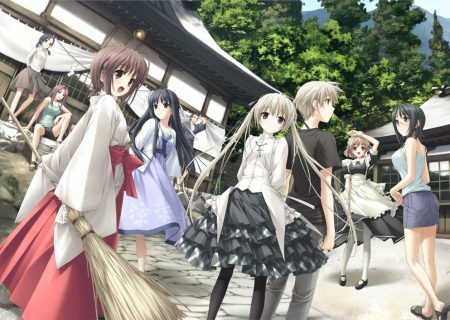 In 2004, a visual novel studio company called Key, that is well known for its ‘AIR’ and ‘CLANNAD’ releases, released the first volume of kinetic novel ‘planetarian’ as a new innovative game style. Players play this game without any multiple choices as if they are watching a movie. Originally, it was released only online for sale. Eventually, its market and platform reached out to more devices and it was released for PS2, PSP and smartphones (Android, iOS). Reviews on ‘planetarian’ were very good and this is a long-awaited movie. It’s going to be released online and in theaters. The animation production for this is ‘david production’, which is known for the TV animation series ‘Jojo’s Bizarre Adventure’. 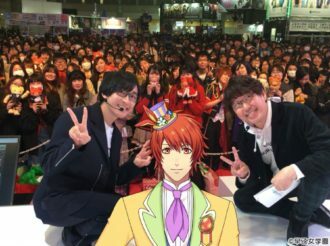 Director Naokatsu Tsuda proved his talent and ability on making this TV anime series, and he openly admits that he is a great fan of Key for many years. Today, Anime!Anime! invites Director Naokatsu Tsuda and Producer Hiroyuki Aoi for an interview. Let’s find out their enthusiasm towards ‘planetarian’ and the true intention why they choose both online and theaters for its distribution. Have no regrets, just do it by ourselves! First, please tell me why you decided to make an animated movie of ‘planetarian’ and why now. Would you like to give me your opinions, Mr. Aoi? Sure. It’s been 12 years since the release of ‘planetarian’. Originally, it was available only online via download sale as the first volume of the new kinetic novel from Key. It didn’t sell that many copies, partly because of the availability of internet back then. However, ‘planetarian’ was successfully released on various platforms in recent years, including streaming overseas in 2014. 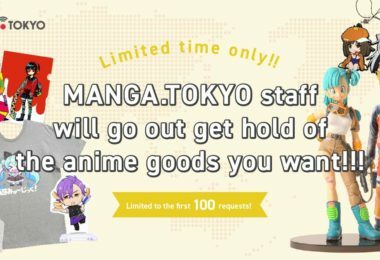 As a result, the number of sales reached 130.000 books. Now is the time, when we have the perfect environment and technologies for networking, to achieve our vision of ‘watch whenever and wherever’ as the original ‘planetarian’ once tried. Additionally, the story’s universality and the theme of human-robot interaction always attracted people, and it’s still the same even after many years. If that’s the case, why not deliver the work now to all the fans who always loved and still love this story. This is how the project began. Moreover, there is no doubt that we all fell for ‘planetarian’. The original release of ‘planetarian’ was in 2004, which was the year that I started my career in Anime. This is the 12th year. There are so many works out there, but I believe that the audience never forgets outstanding work that is created thoroughly. I think ‘planetarian’ is a perfect example of that. It is clearly sci-fi, but its setting isn’t outdated even now. I’m positive that this title would be still great to turn into animation and catch people’s attention even after 10 years. In addition, as Aoi says, we are not tied to any particular platform, and that significantly pushes us to make this animation now. What were the processes like to decide on ‘david production’ and the director Mr. Tsuda? ‘david production’ pays the maximum respect on the original work, and that makes them stand out. Many Key fans also seem to be very attached to ‘planetarian’…and when I thought of a production studio that can respond to fans’ exact demands, I could only come up with ‘david production’. Having said so, I wasn’t expecting to see Mr. Tsuda as the director. I knew he was very busy with ‘Jojo’s Bizarre Adventure’ (lol). I’m a director employed by david production, so I regularly attend the planning meeting there. In the meeting with a group of david production’s producers, we had an opportunity to discuss who would be the best for the role of the ‘planetarian’ director. 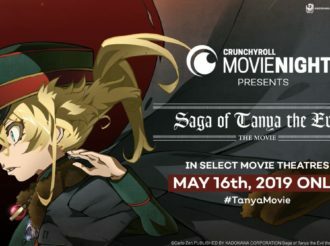 There, I honestly didn’t want to regret giving up this chance to work with Key anime that I love…so, I raised my hand (lol) and grabbed this opportunity by myself! In the team of ‘planetarian’, we have Mr. Katsuichi Nakayama who was the assistant director for ‘Evangelion: 2.0 You Can (Not) Advance’ and ‘Evangelion: 3.0 You Can (Not) Redo’, as well as Mr. Toshiyuki Kato who is from ‘Jojo’s Bizarre Adventure’ and also directed ‘Level E’. With these great series directors, I only need to act as a guide to lead the team wherever ‘planetarian’ has to head to. So, how do you guide the team of ‘planetarian’? This story has a clear intention of what to deliver to the fans and how to do so. In other words, we needed to focus on a movie-like approach that required delivering scenes in shorter time than those in TV series. So, I wrote the scenario in order to adjust the work for the movie. By doing so, I could relate to the work much deeper when it was in the process of creating storyboards. I could re-approach the story from scratch. Mr. Tsuda shares the role of Sound Director with Mr. Takayuki Yamaguchi, too. Regarding the music, I created it by talking to Mr. Yamaguchi and finalized the order. When the music came through, I combined that with the storyboards to find effective use of the music in the movie. Mr. Yamaguchi, Sound Director, and I repeated discussions until we both agreed. We are in the same generation, and that makes it ideal to exchange our ideas. I trust and respect his opinions. I noticed that you and Mr. Shogo Yasukawa also shared a role of Scriptwriter. Is this also for the same reason as mentioned before? Yeah, that’s right. I frequently exchanged opinions with him and wrote a brief structure for Mr. Yasukawa to finalize that. Then, we both contributed to write up the scenario together. We worked together for ‘Jojo’s’, and that made it easier as partners this time. Sound Director and Script Writer are both male in this movie, but I got to select people who could engage to the work both emotionally and empathetically. It sounds like you are passionate to grasp the overall situation. Yes, I do make sure that I talk to each and single member of the staff to make this ‘planetarian’. I heard you had total control over the casting of the visual art staff. The big change would be the appearance of the main guy, Kuzuya, right? He doesn’t have a physical appearance in the original work, so how did you come up with the design? Firstly, I already had two people in my mind, Mr. Daisuke Ono and Ms. Keiko Suzuki from the original ‘planetarian’. I wouldn’t accept the movie without them if I were the original fan, and I definitely wanted them as our team members. It’s typical to see a character looks like its voice actor when it’s based only on the voice. We also added manliness from male characters of Eiji Komatsu. In addition, in a bishojo/gal game, the face of a protagonist is often hiding behind her fringe, so we employed this theory to complete the designs of the characters. 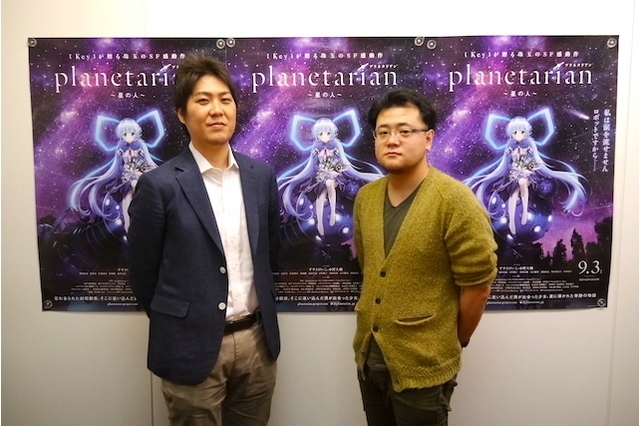 Mr. Ono mentioned that he was still young and new in his career when he got the role in ‘planetarian’. So, this is very emotional and important to again be a part of animation after 12 years. I thought that the preview screening was impeccable, delivering special feeling towards the movie from Mr. Ono but also from Director. Characters’ acting in this animation is great in details and has a great impact on the movie. 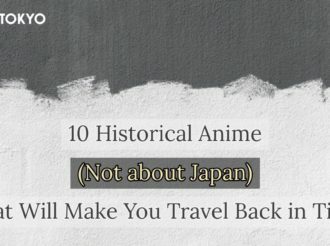 This movie contains some scenes what we call ‘pictures tell us all’, which is unique to anime. Unlike games or manga, anime doesn’t stop for its viewers. So, we intentionally control the speed of some simple scenes that the game players may have been clinging to for good memories. It was difficult to create the process that Kuzuya falling for Yumemi, wasn’t it? Yes, we spent lots of time to decide at what point he changes. Yumemi is a robot, so Kuzuya can’t act as a guy ‘who starts to play with his “bishojo figure” when he is stuck with creating storyboards’ (lol). Yumemi responds to him. Kuzuya lives in dystopia, and how he transforms himself through the interaction with Yumemi, the programmed robot, is crucial. At the end of the day, viewers would realize that this main character Kuzuya actually symbolizes ‘us’. Being a player, but also a viewer. That’s right. How do we live through this tough time? What do we face and what do we need to be prepared for? What does it mean to live being true to yourself? You may have something bugging you in your life, and it would be great if you decide to face that even if that’s only small…We’re hoping to conclude the story that way. You’re going to show ‘Chiisana hoshi no yume’ (the reverie of a little planet) online and ‘Hoshi no hito’ (man of the stars) in theaters. The first one is a subtitle from the original game, and the latter one is written for a novel and a voice drama, which requires a larger time scale. So, you’re going to complete the whole thing in this movie. Yes. ‘planetarian is not just about Kuzuya and Yumemi. The novel and the voice drama released after the main game added a much wider world to the story. I believe that pushes this movie from a fine work to a masterpiece. In the online version, we deliver the story from the game. You get to learn how Kuzuya lived after the game story in the theater version. Along with the theme song by Lia, this movie is going to be the best in the history of Key works. How would you describe ‘Hoshi no hito’, the theater version? It includes the reconstructed online version. The projection scene in the planetarium would stand out on a massive screen, so hopefully the audience will like that. Yes, I thought that projection scene was very impressive. 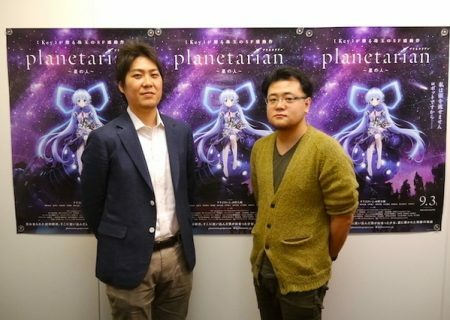 Director of Photography Mr. Arimasa Watanabe, who did ‘Fate/kaleid liner Prisma☆Illya’ is a big fan of the original ‘planetarian’, and he worked very hard for this movie being very particular about the details. Quite possibly, this one went through the most outstanding shooting process. Unfortunately, we can’t normally afford spending too much time for shooting in making TV series…but I wanted to be precise about the lens effects in this movie. To be honest, I was amazed at the lens effects of ‘Tamako Love Story’ that I went to see two years ago. It really got me when I saw bokeh or shallow focus just like in good Japanese movies, because such a detailed lens effect was something that I always wanted to employ. At the same time, I realized that lens effects were very effective for theater viewing. This time, I have employed plenty of lens effects and requested to go into detail to create each single frame. So, I think that online viewers will be astonished about how much depth the theater version offer for the same scenes. Theater version is not packed with highlights. So, you’re saying that viewers will virtually discover something in the theater version, is that right? That’s what I think. We have a different approach to the music as well. The theater version is not packed with highlights. It would be good if that serves as a hidden interpretation, and I’m sure that will satisfy the audience. 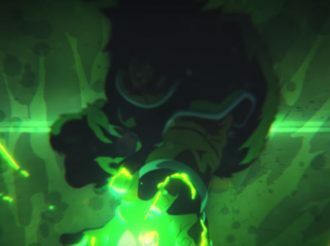 I must mention that because of all the passion from Mr. Tsuda, each episode of the online version is easily over 10 minutes against the original plan. Is there anything else that you’d like to recommend? I’d like to add that we focused on the robotic side of the heroine Yumemi. She is pretty as you can see, but I wanted to describe how we all have the moment of ‘What’s this computer doing?’…we get frustrated with machines for not working as we wanted them to. I would like to include the approach like this in my anime. Machines simply react to what we order or type in based on their program. However, our emotions still go up and down when they do the wrong things. This is the sort of the point that I’d like to make in there. 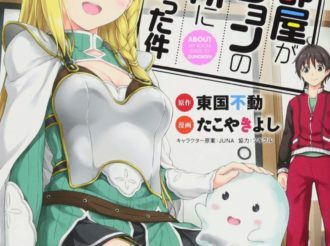 Mr. Yuuichi Suzumoto, the original writer, has a much more realistic view compared to other Key titles. I think people overseas value that kind of hard-boiled Sci-Fi anime. Mismatching scenes of a pretty girl in a dystopia…this is so different from other Key titles. Thank you very much. Lastly, could you leave a message to our readers, please? 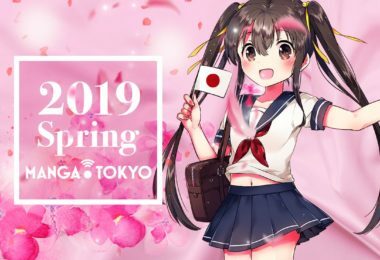 After reading this interview, if you are interested in ‘planetarian’, please check out the online version first. There are only 5 episodes in total, and each one lasts only for around 10 minutes. So, hopefully you can enjoy that pretty casually. I’m sure the episodes are going to be unforgettable. The viewers will know that we took this ‘planetarian’ seriously from the way we describe the whole anime. We carefully took over the ‘planetarian world’ from the original as well. This means that game fans can experience what they remembered from the game. I would love to see the audience talk about ‘planetarian’ after watching the online version. Then, it would be great if they decide to go see the theater version. I’m planning to go see it secretly along with everyone…so let’s watch it together!! (lol) Hope to see you there! Thank you, everyone. 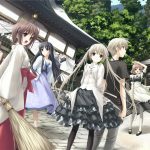 “Yosuga no Sora”, Release of Long Awaited Blu-ray Box!